About | Robert P. Heaney, M.D. Robert P. Heaney, BS’47, MD’51, is a professor in the Creighton University School of Medicine, researcher in the Creighton University Osteoporosis Research Center, and holder of the John A. Creighton University Professorship, an all-university chair named in honor of the University’s founder. Dr. Heaney has worked for over 50 years in the study of osteoporosis, vitamin D, and calcium physiology. He is the author of three books and has published over 400 original papers, chapters, monographs, and reviews in scientific and educational fields. The major theme of his work has been quantitative physiology, for example, how much vitamin D is metabolized each day, how much vitamin D is synthesized in the skin, and the degree to which skin pigmentation modifies that synthesis, how much vitamin D is stored, and the extent to which input levels modify that change. At the same time, he has engaged nutritional policy issues and has helped redefine the context for estimating nutrient requirements. Specifically he has shown that nutrient deficiencies produce long-latency disease as well as their classical acute disorders, and has focused attention on the inadequacy of drug-based research designs for the evaluation of nutrient efficacy. Dr. Heaney serves or has served on the editorial boards of all the major scientific publications in the field of bone biology and chaired the Scientific Advisory Panel on Osteoporosis of the Office of Technology Assessment (U.S. Congress). He is a past member of the Board of Directors of Loyola University of Chicago and of the Association of Academic Health Centers, and currently is an emeritus member of the Board of Trustees of the National Osteoporosis Foundation. He served as a member of the panel on Calcium and Related Nutrients of the Food and Nutrition Board (NAS) in the most recent setting of the DRIs for bone-related nutrients. He interned and served his residency in Internal Medicine at St. Louis City Hospital in St. Louis, Missouri, and served Research Fellowships at the Oklahoma Medical Research Foundation in Oklahoma City, Oklahoma, and at the National Institutes of Health in Bethesda, Maryland. 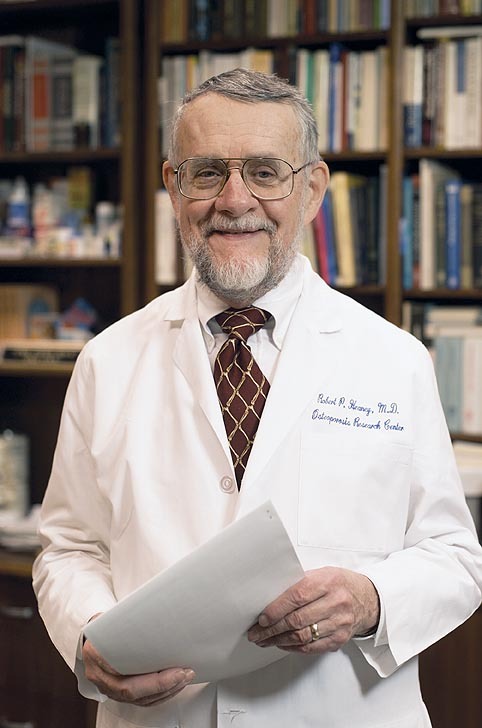 He has held faculty appointments at the University of Oklahoma, at George Washington University, and at Creighton, where for nine years he served as Chairman of the Department of Internal Medicine from 1961-1969. Dr. Heaney was Creighton’s first Vice-President for Health Sciences, a position he held from 1971-1984, at which time he was given the John A. Creighton University Professorship.